Welcome to the monthly Health and Human Rights Media Watch. Members of the Health Advisory Council monitor relevant organizations and websites and compile a list of important news and issues which are summarized here. These newsletters will be posted on our website and archived as a resource. If you wish to join this effort, contact alicerothchild@gmail.com. Please feel free to share the newsletter with your colleagues and communities and encourage them to join the JVP Health Advisory Council. A Palestinian girl was forced to travel without either of her parents from Gaza to the central occupied West Bank city of Ramallah, where she was scheduled to receive a kidney transplant. Earlier in February, Al Mezan Center for Human Rights, Amnesty International, Human Rights Watch, Medical Aid for Palestinians (MAP), and Physicians for Human Rights Israel (PHRI) released a joint statement saying the record-low rate of permits issued by Israel for Palestinians seeking vital medical treatment outside Gaza “underlines the urgent need for Israel to end its decade-long closure of the Gaza Strip.” Israeli authorities approved permits for medical appointments for only 54 percent of those who applied in 2017, the lowest rate since the World Health Organization (WHO) began collecting figures in 2008. As long as Gaza remains on the brink of collapse, international donors keep the flow of humanitarian aid money going. If the crisis were ended and the siege lifted, it is safe to assume that that the international donors would change the type of aid they provide and return to focus on the development of the Gazan economy. This type of aid would likely compete with certain branches of Israeli companies and therefore threaten the Israeli economy. Keeping Gaza on the verge of collapse keeps international humanitarian aid money flowing exactly to where it benefits Israeli economic interests. This is a powerful review by psychoanalyst Judith Deutsch of Norman Finkelstein’s new book: Gaza: An Inquest into its Martyrdom. The article outlines Finkelstein’s meticulous analysis of Israel’s atrocities and the moral depravity within humanitarian institutions that white washed multiple war crimes and crimes against humanity. Here is an excellent summary documenting the loss of the right to health for children in Gaza and the worsening morbidity and mortality indicators. This is due to a combination of Israeli and Palestinian authorities and policies, recurrent wars, malnutrition, lack of electricity and clean water, and the difficulties in obtaining permits to leave for high level care. Another excellent summary regarding the ongoing humanitarian medical catastrophe in Gaza, a crisis that is both manufactured and political, with a focus on the slow death facing cancer patients who are unable to get treatment. Israeli forces shot and killed a deaf Palestinian man in the southern occupied West Bank city of Hebron on March 9th, during clashes that were taking place in the Bab al-Zawiya area of the city. The man was identified as 24-year-old Muhammad Zain al-Jaabari, a father of two from the city of Hebron. Witnesses claimed that al-Jaabari was not actively engaged in the confrontations when he was shot. Israeli forces have long been criticized for their use of excessive force against Palestinians, and what rights groups have termed their policy of “extrajudicial execution” in instances where Palestinians who did not pose a direct threat to the lives of soldiers could have been detained in a non-lethal manner. Israeli forces attacked Palestinian medics attempting to save an injured youth in the West Bank city of al-Bireh. This is a clear cut violation of internationally recognized standards of medical neutrality documented on video. In March 2018, B’tselem issued a report entitled, “Minors in Jeopardy: Violation of the Rights of Palestinian Minors by Israel’s Military Courts,” detailing the continued arrest, detention and violation of the rights of Palestinian children by Israeli security forces and the Israeli military. 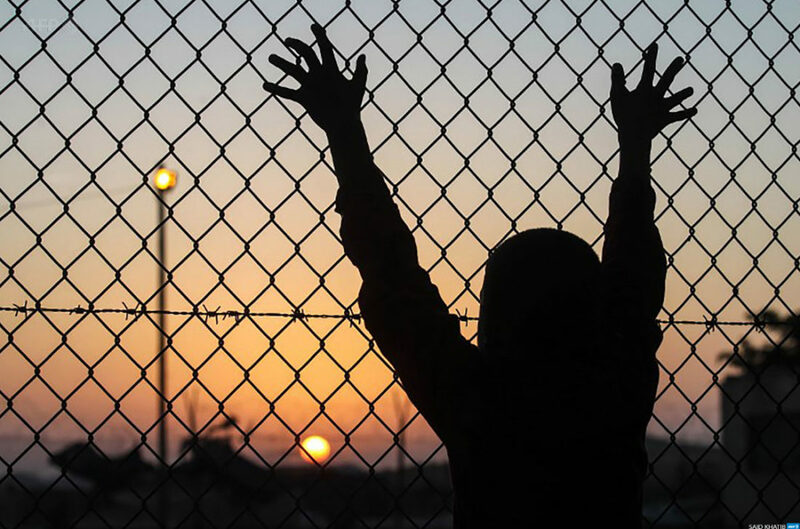 The report documents the arrest and detention of increasing numbers of Palestinian children from less than 14 to 18 years of age, their psychological and physical abuse by security forces, interrogation without representation, coerced confessions, and the nearly 100% conviction rate by the Military Juvenile Court. In addition to extensive statistical documentation, the report includes testimonies from child victims of Israeli detention and their families. This article provides an overview of Israeli abuses against Palestinian Children in 2017. Israeli forces killed 14 children in the Occupied Palestinian Territory (OPT) during 2017 and detained on an average of 300 children each month for “security offenses”. Almost 75% of children endured some form of physical violence following arrest. There was more documentation regarding child arrests, forced confessions, and detentions in the West Bank. Palestinian social worker, Munther Amira, was sentenced to six months in prison after being arrested for peacefully protesting the detention of Ahed Tamimi and her mother, Nariman. His conviction was been met with international condemnation and he is considered a prisoner of conscience. The Euro-Mediterranean Human Rights Monitor published a report today detailing the series of measures to reduce relief services and staff by the United Nations Relief and Works Agency for Palestine Refugees (UNRWA), investigating the resulting catastrophic impact on Palestinian refugees residing in the agency’s five fields of operations. The reduction of UNRWA services means depriving more than 5.8 million Palestinian refugees of basic services such as education and healthcare. It also means causing a closure of 702 UNRWA schools, depriving more than 500,000 refugee students of access to education and the collective layoff of some 30,000 of the Agency’s staff members, furthering the precarious humanitarian and social situation. Palestine Monitor reported that Yousef Jabareen, a Palestinian member of the Knesset, was banned from traveling to the US to lecture on the issue of democracy in Israel. Jabareen is a lawyer with degrees from the Hebrew University in Jerusalem and Georgetown University Law Center. He was invited by JVP to present a series of lectures at US universities and other institutions. In a clear violation of free speech and democratic principles, the Knesset Ethics Committee banned him from traveling because of JVP’s support for the worldwide Boycott, Divestment and Sanctions movement. African asylum seekers in Israel are deported to Rwanda where there is a well-oiled machine that pushes them out of the country as soon as possible. Of the several thousand asylum seekers that Israel has already deported to Rwanda, only eight remain there. The rest crossed the border into neighboring Uganda. In other instances, they are dumped directly into Uganda, often losing their papers in the process.